Could Rooibos tea help you drink yourself THIN? It's the time of year that traditionally sees people ramping up their efforts to lose weight. And if you're one of them, you might be wise to make drinking a cup of rooibos tea a regular habit. Channel 4's Food Unwrapped has revealed how the South African staple contains a unique compound that's been proven to reduce the level of fat accumulated in cells. 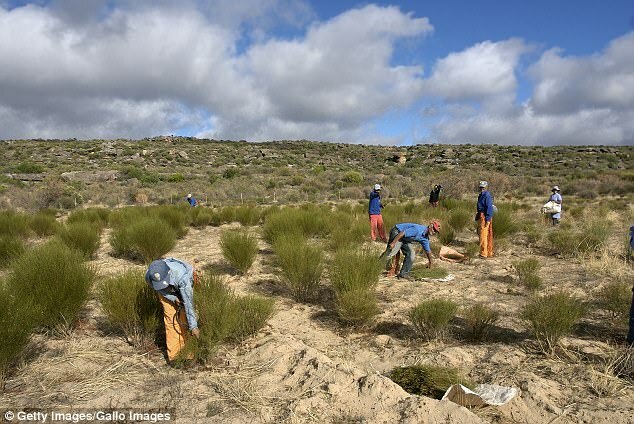 The rooibos - or 'red bush' - plant used to make the tea contains aspalathin, which has also been shown to lower glucose levels over time - albeit if you're drinking six cups a day. Tests carried out on rodents by the South African Medical Research Council using a concentration of aspalathin showed a significant reduction in the amount of fat stored over time. 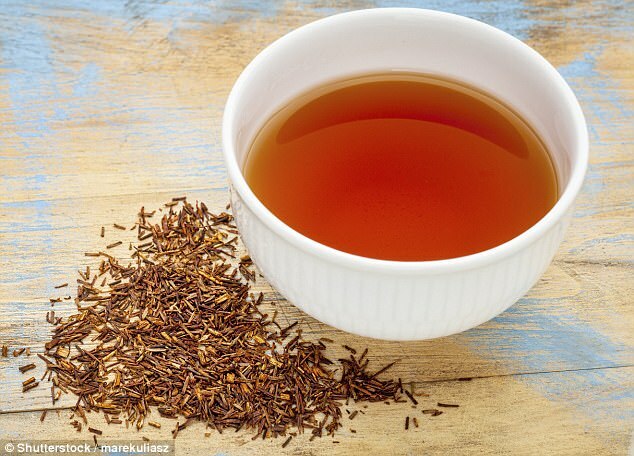 A limited study has also shown people who drank six cups of rooibos tea every day for six weeks had significantly lower glucose levels by the end of the trial. High blood glucose levels can lead to significant health problems, including kidney disease, heart disease and strokes. 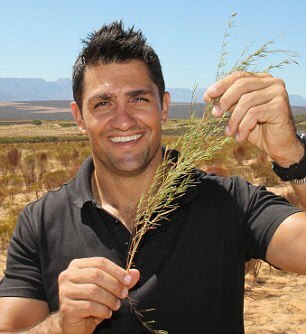 Aspalathin, which is an antioxidant, and its reputation as a 'magic ingredient' among weight watchers, inspired a trip to South Africa for Food Unwrapped's Summer Diet Special, which saw presenter Kiran Jethwa travel to the Cederberg Mountains to see where the tea is grown. The hardy plant thrives in the tough, arid conditions of the Cederberg Mountains, growing in sandy soil and surviving extreme variations in temperature. Rooibos is the focus of Channel 4's Food Unwrapped Summer Diet Special when presenter Kiran Jethwa travels to the Cederberg Mountains in South Africa where it is exclusively grown. The hardy plant thrives in the difficult arid conditions of the mountains, growing in the sandy soil and surviving the extreme temperature variations. 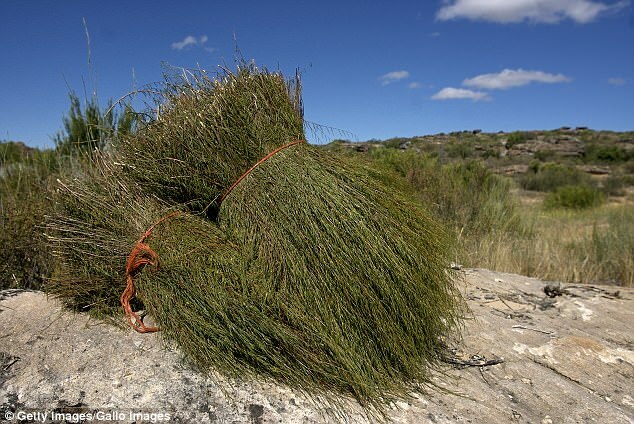 It's produced on a crop of land the size of Yorkshire, which produces the global supply of rooibos. Rooibos, which isn't actually a tea, but rather part of the legume family, is hand-picked, and the green needle-like leaves are then machine-cut before being laid out to dry in the South African sun. After the leaves are beaten and pressed, the oxidisation process that occurs turns the rooibos to the red colour it is known for. South Africans swear by the brew, which they are said to drink 'like water'. A scientist interviewed by Food Unwrapped described the results of the research as 'encouraging', and the rodents had displayed signs of 'getting skinnier'. South African's staple rooibos tea is rich in polyphenols, organic chemicals boasting antioxidant properties. Polyphenols - including aspalathin - help to rid the body of free radicals, and as such can help to ward off cancer and heart disease. When using the oils, I recommend journaling about which oils you have chosen, writing about how they made you feel or what you noticed during and after. Notice how you feel after using the essential oils and the different techniques, compared to how you felt before. Get in-tune with your body. Mix 2 drops of up to 3 different oils in 15ml of carrier oil – such as Grapeseedor Sweet Almond – and massage your chakra blends into the area of the body you are focusing on. This will mean that the essential oils get absorbed into your blood stream and can stay in your body, working to balance your chakras, for up to a week. This is great for things like throat, heart, solar plexus and sacral chakra balancing – and can be really relaxing too! Solar Plexus: 3 drops Bergamot, 2 drops Cypress and 1 drop of Ginger or Cinnamon– a warming and reassuring mix. Our bodies are quite miraculous with the capacity to heal despite all the abuse, stress, sleep deprivation and junky food we eat. But sometimes the craziness of life interferes with our bodies’ natural capacity to be healthy and well. Growing up as the daughter of a pediatrician, Western medicine is something I have benefited from and believe in. If, heaven forbid, I was ever to contract a serious illness, I would most definitely be marching straight to my doctor and the field of conventional medicine to get me well. But, that might not be all I would be doing. I just wrapped up a course at the Institute for Holistic Nutrition that I LOVED and found SO inspiring that I wanted to share some of the things I learned with you. The course was about energy pathways to health and how electrical, electromagnetic and ‘subtle’ energies give our bodies life AND they form the foundation of our health. If you are already rolling your eyes, or skeptical, be warned, this is probably not your cup of tea. But, this isn’t just airy fairy stuff, it has its merits. Health and wellness have become a greater focal point in my life. I’m not just talking about eating better. There are preventative and alternative measures to explore that will take your health and vitality to the next level, which is why I loved what I just learned at school. For those of you who haven’t stopped reading yet, thank you and good for you for keeping an open mind. Maybe you will learn something and think this is as COOL as I do! Energy medicine can be used as a complement to other approaches to medical care for physical illness. But, what is most compelling, is that it’s a world of esoteric possibilities capable of providing answers and healing for some of the emotional baggage we carry with us. According to energy medicine, the human spirit is a manifestation of energy. You heal the body by activating its natural healing energies and restoring energies that have become weak, disturbed or out of balance. When one or more of your chakras is too open or closed, it has an impact on specific organ systems, endocrine glands and specific emotional states. For example, Root chakra is all about safety, security, survival and issues surrounding family. If you have past or present unresolved issues revolving around those things, it can help explain certain health issues relating to your immune system, bones, joints, blood, spine or adrenals. In other words, when one of these chakras (ie energy centers) drags or is broken, the whole will not operate as intended and that’s why we can feel ‘off’ physically or emotionally. Energy medicine is the acceptance that chakras aren’t just storage facilities for the experiences of our past. They can also be utilized for our healing. Within each chakra there is the capacity to transmute balls of energy filled with negative toxic memory and emotion, and transform and convert this energy into a form that is no longer harmful to the functioning of our cells. ‘How?’ you ask. Once you isolate which chakra is off balance, it can be repaired and healed with the right kind of foods, colour therapy, essential oil therapy, meditation, healing affirmations, physical exercise or prayer. The key is to fully express and resolve the pain and stress of an event that has affected your chakra. When we hold onto the negative experiences of our past, they interfere with the flow of ‘chi’ energy, not only in the organs and tissues but, within the chakra and meridian systems of the body. So…when conventional methods don’t make you feel better, the good news is there’s a whole world of possibilities. I’d love to hear what alternative healing practices you have explored and/or gravitate towards. Please share! Within each of us lies a subtle energy system, through which our energy flows and expands, allowing us to shine from the inside out. Widely referred to as our Chakra System, this invisible yet wildly powerful network runs from the base of your spine to the crown of your head. And within this system are seven individual energy centers, known as your chakras. Each chakra is associated with certain parts of the body, as well as specific mental and spiritual components, to which it feeds energy. When balanced and nourished, our chakras open, allowing energy to flow in and out effortlessly, extending this vitality and abundance to all pillars of life. Our lifestyle, habits, diet, thoughts, words, emotions, relationships, and life experiences all profoundly affect our chakras. It is so important to our health, wealth, and happiness that we become aware of this energy system and how our own actions affect it. And so, we present to you the S-Life Understanding Your Chakra System series. Over the next seven weeks, we will introduce a different chakra (working our way up the body), and what you can do to elevate and sustain your unique and divine energy in each area. Our third chakra, the solar plexus, serves as our most vital energy center and source of personal power. In Sanskrit, this chakra is referred to as Manipura, translating to "lustrous gem". Like the sun, this energy center emits a bright yellow hue, beginning at the naval and ascending up to the breastbone. This single energy center radiates our vital life force (or prana) throughout the entire body. Here, we are able to harness our dreams, desires, and passions, and turn those #ThoughtsToThings. Our ability to achieve, our self-discipline, self-esteem and willpower are all governed by the solar plexus. Our solar plexus houses our inner fire -- the passion, drive, and sense of purpose that propels us forward towards our goals and dreams. While our second chakra seeks pleasure and enjoyment, this third energy source is all about cultivating and harnessing our inner strength and power and transforming that energy into something tangible. Without a balanced and healthy third chakra, our motivation dwindles, our passion and sense of purpose falls to the wayside, and our self-esteem suffers big time. And on the flip side, an overly-stimulated solar plexus chakra can lead to an unbalanced life where work and achievement are prioritized over all else. With all things, balance is so very key here. By nurturing and tapping into this deeply empowering energy source, we are able to step into our personal power and create the life of our dreams with confidence, passion, and warmth. Physically, the solar plexus governs our metabolism and digestive system. Digestive issues can very often be traced back to an unbalanced or inactive third chakra. Similarly, a bit of our intuition is also housed here -- those “gut feelings” that gently guide you in the direction of your purpose actually do originate in the gut. If your digestive fire is low, or perhaps you’ve lost touch with your sense of intuition here, begin to focus a little love and attention on your third chakra. When out of balance, you may experience: indecisiveness, perfectionism, low self-esteem, you may be overly passive, unmotivated, depleted, overly judgmental and critical, experience self-doubt, poor digestion, ulcers, a slowed metabolism, and colon disease. When properly balanced, you will feel self-confident, reliable, empowered, motivated, purposeful, passionate, decisive, responsible, warm and joyful, deeply energized, and experience healthy digestion and a steady metabolism. So how do we go about balancing, loving, and supporting this sacred and empowering energy system? Creating a clear vision for the life of your dreams helps to activate the solar plexus chakra. By setting intentions and clarifying your goals, you’ll stoke the flames of your inner fire and personal power, and in turn will move confidently in the direction of your purpose and passion. Set aside time regularly to get clear on what exactly it is that you want, and write it down. Release the need for perfectionism -- nothing is written in stone. Your goals and intentions can be revisited and revised as often as you’d like. The important part is that you connect with a sense of personal purpose. Eating sunny yellow foods brings balance to this energy center -- think yellow peppers, lemons, corn, bananas, and pineapple. This chakra oversees the conversion and distribution of energy to the body and mind, so choosing stable sources of energy are key to maintaining balance here. Avoid processed carbohydrates and sugars, and instead opt for gluten-free whole grains that will provide slow-burning, long-lasting energy such as quinoa, brown or black rice, amaranth, buckwheat, and oats.